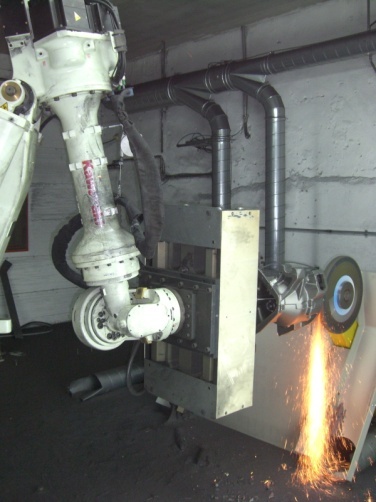 Tiesse Robot, a leader company - founded in 1976, with an over 35-years experience in robotics, successfully applies its design know-how in various industry fields, especially in the foundry of aluminium and ferrous materials, handling, machine tool tending, etc. Since its foundation Tiesse Robot has delivered over 5.000 systems among robots and robotic cells. Since 1992 it has achieved, unique in Italy, a joint venture with Japanese giant Kawasaki and it is structured to offer a complete service to its customers: presales support, design, production, installation and after-sales service, thus creating a full internal chain that guarantees the quality of the final product. 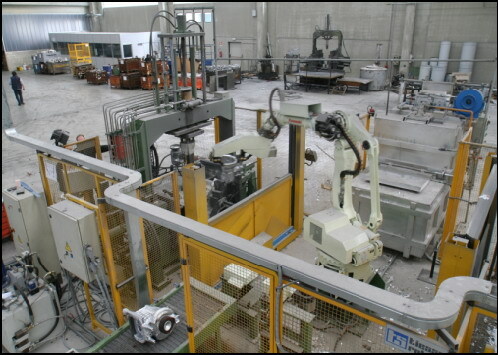 Tending to die-casting systems with robots for handling of castings, inserts and moulds lubrication. Tending to Machining equipment with various types of parts magazine and with the aid of especially advanced vision systems. Off-Line programming software and Supervision systems for working cells.